40 ct. Summer Khaki (over-dyed w/tan rit dye), NPI silks. 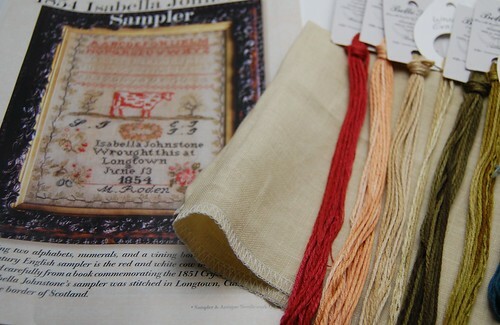 I picked up the latest Sampler and Antique Needlework Quarterlies at my Florida LNS (Silk Road Needle Arts). 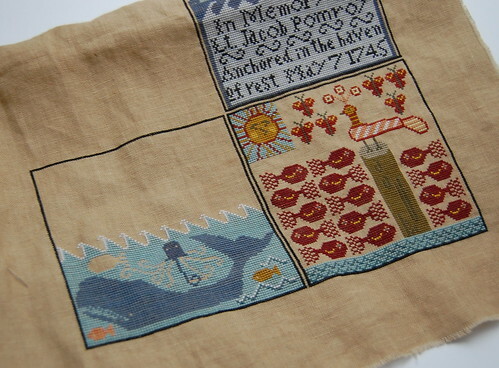 I really want to stitch the Isabella Johnstone Sampler in the Summer issue. 40 ct. Pearled Barley, Belle Soie silks. Check out Tanya's finished Sampler here. It's just gorgeous!! Tanya is such an inspiration to me. She picks the most beautiful samplers to stitch! It's always hard to get stitching done during the summer, isn't it? Love your Shores so far though. The fabric you chose for Isabella Johnstone looks great with the fibers! You are definitely having a busy summer. Shores is gorgeous and I can't wait to see your Isabella :-). Glad to see you post again. I was starting to worry. I always look forward to your updates. Enjoy Michigan. Cooler temps, ah, yes! Can't wait to see your progress on the new one. Beautiful colors! Sounds like a busy, but fun summer. I hope you'll find some relieve from the heat and humidity in Michigan... but ya know... it's been hot and humid in Michigan too! Shores looks fabulous and I'm looking forward to seeing your Isabella. If you drive through Indiana, wave hello as you pass by. It's pretty hot and humid here at the moment, but hopefully Michigan will be cooler. You're a busy girl! Shores is looking beautiful and I can't wait to see your start on Isabella. She's on my to-stitch list too! Glad to see you had a good trip to Florida. Hope you have a safe trip to MI too! Just bring us back a load of that "cool air" come back! Hope you find to stitch soon. Wow! You were really close to me while down this way. Glad you enjoyed some of our nice Florida sunshine, ahem, I mean afternoon storms, LOL! You're going to MI??? Wow, now you will really get a dose of heat. They are in the midst of a heatwave right now. My mom said it's been in the 80s/90s every night...Well, safe travels anyway! Hopefully you will get more stitching time on this trip. You're making great progress on Shores, Nicole! Have a fun trip to Michigan! Whew, what horrible temps! I hope you are staying cool! Your finishes are just lovely and can't wait to see what is in store next! I know what you mean about stitching going on hold during the summer months. Just when I think I have a day or two of solid stitching time, something always comes up!! I love your fabric and threads for the Isabella Johnstone Sampler. I love the Jersey cow...adorable! Sorry to tell you, but Michigan has been in the mid 90s and humid for a few weeks now. We're currently in a cold spell at around 88 today and only slightly less humidity, but... whereabouts are you heading? I always find it hard to get stitching done when I'm on vacation! I usually bring a bunch of things and if I get in ten stitches, I'm lucky. Shores looks GREAT!! I think you've convinced me that I need to do Isabella, too. Have a fantastic trip to Michigan. Safe travels. Ah Nicole, you inspire me just as much! You are quite the wanderer this summer. I hope Michigan is cooler for you. Have a safe trip. I hope you're having a fabulous time, Nicole! The Red Cow sampler is gorgeous and FUN! I'm hoping for an end-of-the-week finish! We are getting awful heat and humidity in VA too. I feel your pain! Your Shores is just beautiful--gorgeous! I'm glad you have a great trip to Florida. Shores is gorgeous! :) Have a fun trip to Michigan and enjoy! Love your stitching! Where in Michigan? I just moved from southern Texas to Midland a few months ago.